Hi everyone, had such a busy week that the craft room goodies have been neglected! I've also been potting up some herbs and flowers as Spring is definitely here, so the verandah will be colourful soon! I made some more of these background panels and decided to add some butterflies to finish one off. The water droplets were stamped in versafine ink then clear embossed. I blended a couple of distress inks over the top and the embossed design resisted the ink. To highlight the droplets I went in to each one with a water brush and dampened it, then used some paper towel to blot and remove some of the colour. It's a great tip that I saw on Eileen's blog. The butterflies were fussy cut and coloured with inktense pencils. I'm linking up to the challenge at Simon Says Wednesday where the theme is totally resistable. At Just Add Ink the theme is to add G. I've gone with Green! At Word Art Wednesday the theme is anything goes with the option of using the free scripture on your project. Water droplet stamp from Designs by Ryn; Memory Box cocoa bean butterfly stamp; versafine ink & clear ep; distress inks; inktense pencils; Kaisercraft mini sentiment stamp. Beautiful card and so dimensional! Striking colors! Fabulous inking! 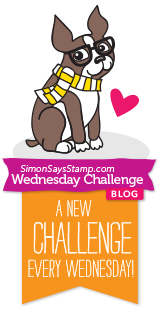 So glad that you join the fun over Simon Says Stamp Wednesday” Totally Resistible”” Challenge! Oh wow! Stunning card! Love butterflies, so ofcourse this is one of my favorites but the raindrops are awesome and the colors blue & green as background is so beautiful. Excellent card! Love the intense colours & beautiful blending in your butterflies and background. The water droplets add such dimension too. Thanks for playing along at Just Add Ink. Your use of colour and inks is just beautiful, Cathy! Those raindrops look so dimensional. Thanks for entering your gorgeous card in our challenge at Just Add Ink this week! Hello Cathy: Your card is gorgeous, love the amazing background colors you blended for your lovely butterflies. What caught my eye was the awesome water drops, they look so real. Thank you for providing the link to Ryn's challenge blog, I love her stamps, I have the one you used plus 2 or 3 more and I love them. I saw your card being picked as an Honorable Mention over at "Just Add Ink" so, congratulations for that. I love the blending of the distress inks and those raindrops look so real. Thanks for the tip about removing some of the color.